Långbanite: Mineral information, data and localities. Minor Ca may replace Mn2+, minor Fe3+ may replace Mn3+. Named in 1877 by Gustav Flink after the type locality: Långban, Sweden. 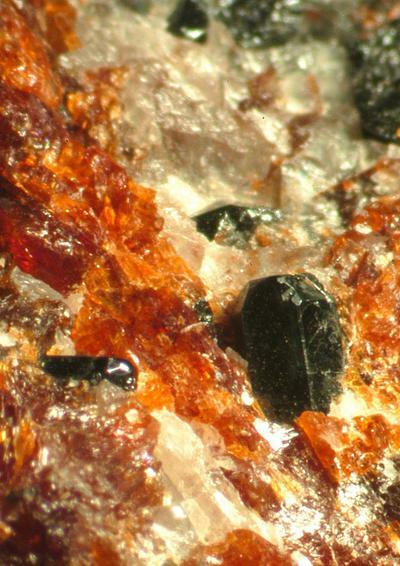 This page provides mineralogical data about Långbanite. Refractive indices recorded for Li light. 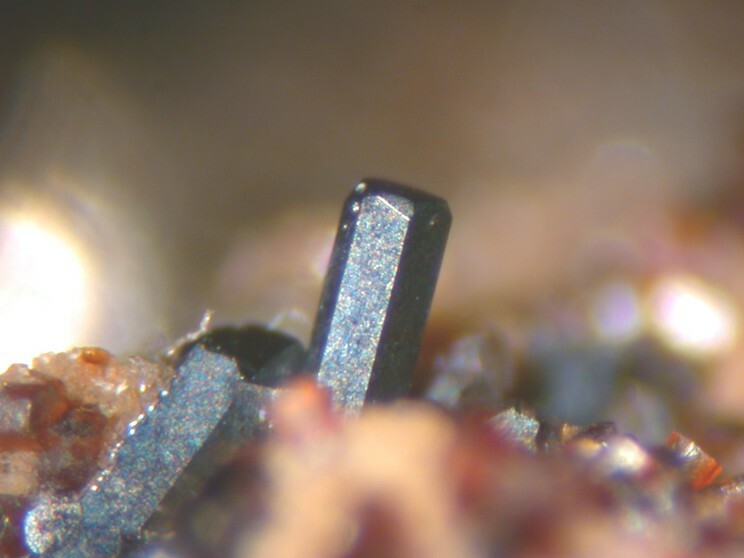 Complex prismatic crystals to 1 cm. Also reported as monoclinic, C2/m, a = 11.561(5) Å, b = 20.05(1) Å, c = 11.075(9) Å, β = 90.03(5)° by Guiseppetti et al. (1991). Short to long black prisms with vertical striations. In crystalline limestones and manganese-rich skarns in metamorphosed manganese deposits. Schefferite 5 photos of Långbanite associated with Schefferite on mindat.org. Rhodonite 4 photos of Långbanite associated with Rhodonite on mindat.org. Calcite 4 photos of Långbanite associated with Calcite on mindat.org. Roméite Group 3 photos of Långbanite associated with Roméite Group on mindat.org. Svabite 1 photo of Långbanite associated with Svabite on mindat.org. Parwelite 1 photo of Långbanite associated with Parwelite on mindat.org. 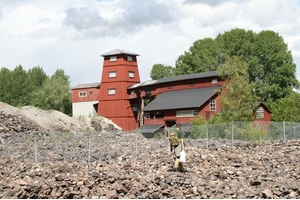 Igelström (1889) Geologiska Föeningens I Stockholm. Förhandlinger, Stockholm: 11: 389 (as Ferrostibian). Igelström (1890) Neues Jahrbuch für Mineralogie, Geologie und Paleontologie, Heidelberg, Stuttgart: 1: 250 (as Ferrostibian). Palache, C., Berman, H., & Frondel, C. (1951), The System of Mineralogy of James Dwight Dana and Edward Salisbury Dana, Yale University 1837-1892, Volume II. John Wiley and Sons, Inc., New York, 7th edition, revised and enlarged, 1124 pp. : 1026 (as Ferrostibian). Moore, P.B. (1967) Contributions to Swedish Mineralogy II Melanostibite; Manganostibite; Ferrostibian = Långbanite. Pabst, A. (1968) New Mineral Names. American Mineralogist: 53: 1779. American Mineralogist (1970): 55: 1489-1499. Moore, P.B, Sen Gupta, P.K., Le Page, Y. (1991): The remarkable långbanite structure type: crystal structure, chemical crystallography and relationship to some other close-packed cation structures. American Mineralogist: 76: 1408-1425. Giuseppetti, G., Mazzi, F., Tadini, C. (1991): The crystal structure of monoclinic långbanite, (Mn,Ca,Fe,Mg)2+4 (Mn,Fe)3+9 Sb5+[O16(SiO4)2]. Neues Jahrbuch für Mineralogie, Monatshefte: 193-211. Neues Jahrbuch für Mineralogie, Monatshefte (1992): 7: 452. Nysten, P. & Ericsson, T. (1994): Fe-rich långbanite from the Nyberget ore-field, Sweden. Neues Jahrbuch für Mineralogie, Monatshefte 1994, 557-566. 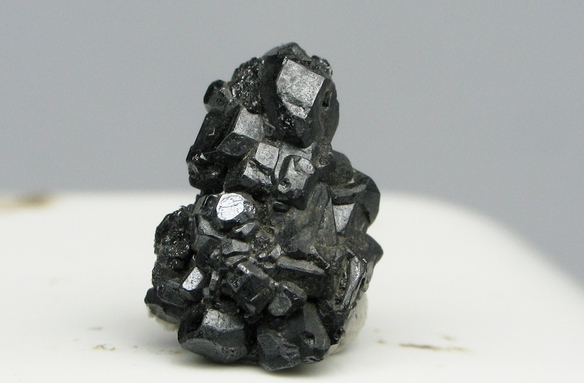 Matsubara, S., Kato, A., Sekiuchi, K. and Hashimoto, E. (1986): Långbanite from the Gozaisho mine, Fukushima Prefecture, Japan. Koubutsu-Gakkai Kou'en-Youshi (Abstracts of the Annual Meeting of the Mineralogical Society of Japan), 39 (in Japanese); Matsubara, S., Kato, A., Shimizu, M., Sekiuchi, K., and Suzuki, M. (1996) Romeite from the Gozaisho mine, Iwaki, Japan. Mineralogical Journal 18, 155-160. Zeits.Krist.Min. (1888) 13, 1-8; Nysten, P., Holtstam, D. and Jonsson, E. (1999) The Långban minerals. In Långban - The mines,their minerals, geology and explorers (D. Holtstam and J. Langhof, eds. ), Swedish Museum of Natural History and Raster Förlag, Stockholm & Chr. Weise Verlag, Munich, pp. 89-183.